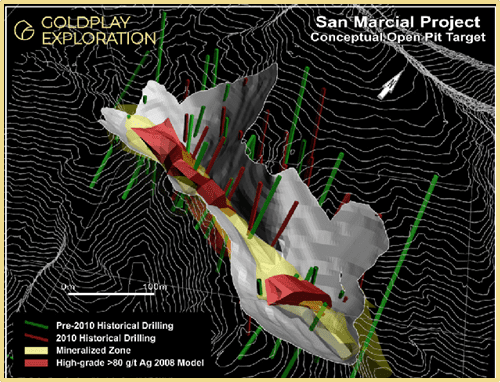 Goldplay Exploration is focused on the discovery of gold-silver deposits in the prolific Rosario Mining District, Sinaloa, Mexico. Our exploration team has over 10 years of experience in the Rosario District with a record of successful discoveries, including the extension of Marlin Gold Mining Ltd’s “La Trinidad” mine, one of Mexico’s highest grade, open pit gold mines. Our 250+km2 exploration portfolio is 100% owned with no earn-in requirements, covering one of the most prospective areas in the Rosario District. 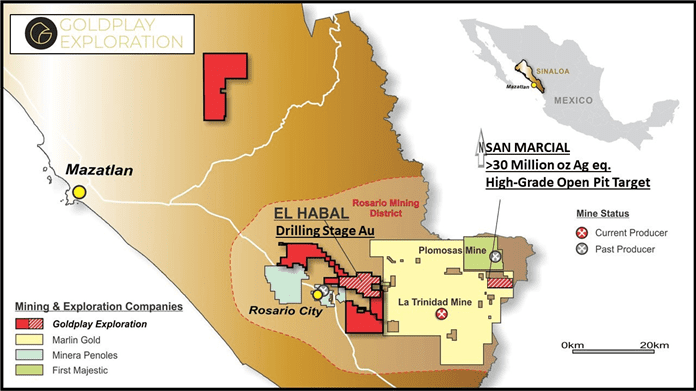 The San Marcial project consists of 1,250 hectares, located south of the La Rastra and Plomosas historical mines and 30 km from the Company’s 100% owned El Habal Project in the historic (gold-silver) Rosario Mining District. 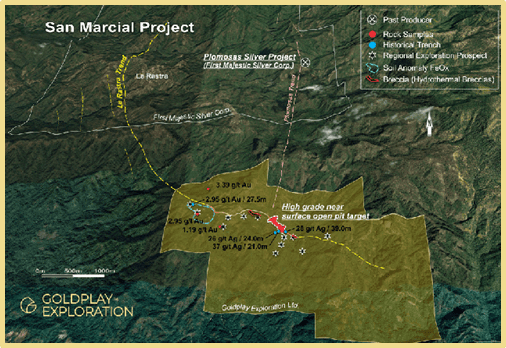 The San Marcial project is an attractive near surface high-grade silver, zinc, lead resource stage project with a historical National Instrument 43-101 – Standards of Disclosure for Mineral Projects (“NI 43-101”) resource, showing attractiveness for bulk tonnage open pit development. The existing historical NI 43-101 resource estimation exhibits significant exploration upside as the previous drilling only explored 600 meters of a 3.5 km mineralized trend. High grade stockwork Au system (9.45m @ 2.05 g/t Au) within wide mineralized zone (77.5 m @ 0.43 g/t Au). Opportunity for expansion down-dip and along strike.